Beginning her new life in a small Oregon town, high school English teacher Jessica tries desperately to hide the details of her past. Yet two individuals remain determined to discover the painful truth: the jealous woman who is Jessica's immediate superior, and Kyle Buchanan, a handsome, compassionate paramedic and dreamer. Will Jessica's past destroy her future? Or can she find a deeper peace that will end her need to keep Secrets? 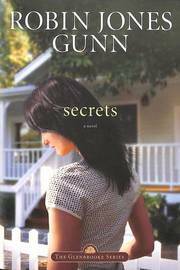 Readers will find out in this bestselling former Palisades release, now the first book of the new Glenbrooke series by bestselling author Robin Jones Gunn. Jessica ran from her past...but can she hide from love? Jessica Morgan wants desperately to forget the past and begin a new life. She chooses a small, peaceful town tucked away in Oregon rs"s Willamette Valley as the place to start over-Glenbrooke. Once there, Jessica conceals her identity from the intriguing personalities she meets-including the compassionate paramedic who desires to protect her and the jealous woman who wants nothing more than to destroy her. Will Jessicars"s deceit ruin all hope for the future? Or will she find a deeper peace that allows her to stop hiding the truth from those who love her most of all? In this new release of the heartwarming bestsellerSecrets,now Book One in the Glenbrooke series, Robin Jones Gunn reintroduces the fascinating characters who have captured the imaginations of readers across the country. Revel once again in the lives and loves of the people of Glenbrooke in this compelling tale of romance and spiritual truth. Sisterchicks Say Ooh La La! !